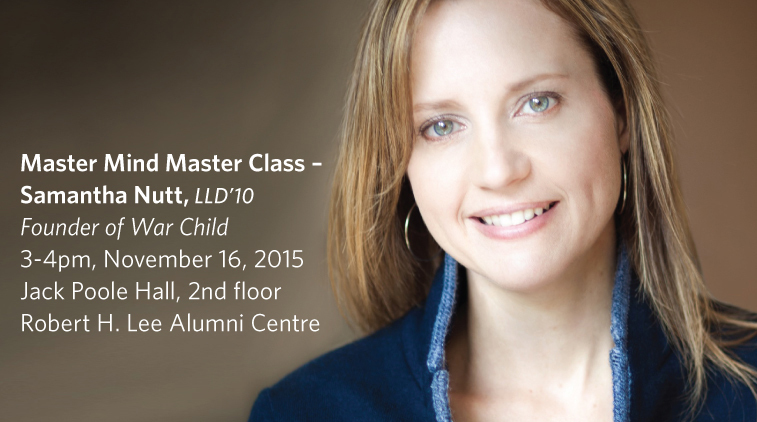 On Monday, November 16th, join fellow UBC students and award-winning humanitarian, bestselling author and acclaimed public speaker, Dr. Samantha Nutt, LLD’10, in a moderated conversation about the impact of war – the truth, the lies, and the reality on the ground – and the major events currently shaping our world. Master Mind Master Class is a new alumni UBC event series, offering both alumni and students an unprecedented look into the minds of modern masters making a unique impact on the world, and the lessons they’ve learned. Dr. Nutt is a medical doctor and a founder of the renowned international humanitarian organization War Child, Dr. Nutt has worked with children and their families at the frontline of many of the world’s major crises – from Iraq to Afghanistan, Somalia to the Democratic Republic of Congo, and Sierra Leone to Darfur, Sudan. A leading authority on current affairs, war, international aid and foreign policy, Dr. Nutt is one of the most intrepid and recognized voices in the humanitarian arena and is amongst the most sought-after public speakers in North America. With a career that has spanned more than two decades and dozens of conflict zones, her international work has benefited hundreds of thousands of war-affected children globally. Kathryn is the lead instructor in the School’s Integrated Journalism program. She also contributes to the International Reporting program and the Reporting in Indigenous Communities course. She also runs the School’s Internship program. Kathryn’s career in journalism began in the late 80s when she joined the Canadian Broadcasting Corporation (CBC) Canada’s public broadcaster. Kathryn is committed to public service journalism and she has worked to develop her journalistic skills to reflect the technological change in the industry. Kathryn’s commitment to the industry is reflected in her approach to the internship program. She has helped to place students in professional practicums across the country and around the world.